A three year project that began in 2013, WellMade provides free online resources designed to help brands better support labour rights in their supply chains. The Fair Wear Foundation (FWF) is lead partner on the initiative, working collaboratively with other partners and associates. If you’re in Paris, you can catch the project for a free workshop tomorrow (10 Feb) at Texworld. Follow WellMade on Facebook and Twitter for updates on resources, as well as future workshops and events. This entry was posted in Child Labour, CSR, Curricula, DESIGN, DESIGN, ECOLOGY, Education, Empowerment, Environment, Forced Labour, Harassment or Abuse, Health and Safety, Hours of Work, Labour, Nondiscrimination, Overtime Compensation, Responsibility, Social Conditions, Social Responsibility, Supply Chain, Wages and Benefits and tagged child labour, CSR, DESIGN, fashion, Labour, supply chains, WellMade on February 9, 2015 by Mary Hanlon. Handprint – Behind the Scenes is a beautiful short film directed by Mary Nighy, commissioned by Livia Firth, Founder and Creative Director of the Green Carpet Challenge. A learning tool, the film is a great way to generate in class/studio discussions surrounding the individuals working within each stage of garment supply/value chains. This entry was posted in Responsibility and tagged apparel manufacturing, Eco-Age, fast fashion, Green Carpet Challenge, Handprint, livia Firth, Mary Nighy, supply chains on November 26, 2013 by Mary Hanlon. 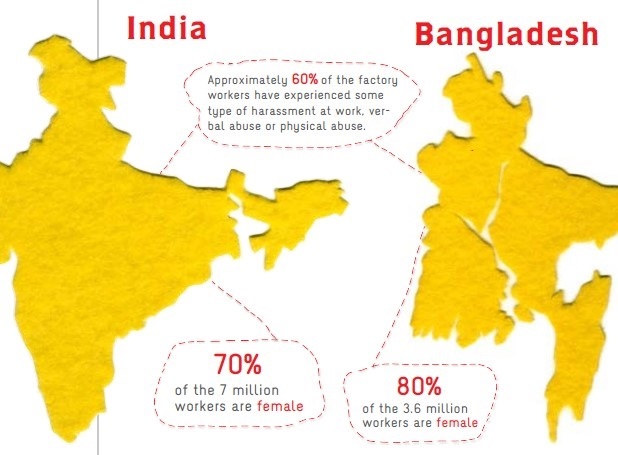 You might recall this post from 2011 announcing a grant had been awarded to the Fair Wear Foundation for work in India and Bangladesh, in partnership with SAVE and Cividep, in India, and the AMRF Society and Awaj Foundation, in Bangladesh. Today, November 25th, is the International Day for the Elimination of Violence Against Women. To mark the occasion, the FWF has released preliminary results from the project, Preventing Workplace Violence. An interesting read; check it out here. This entry was posted in Bangladesh, Responsibility, Social Conditions, Supply Chain and tagged AMRF Society, apparel manufacturing, Awaj, Bangladesh, Cividep, Fair Wear Foundation, fashion, India, November 25, SAVE, supply chains, United Nations, value chains, Violence Against Women on November 25, 2013 by Mary Hanlon.